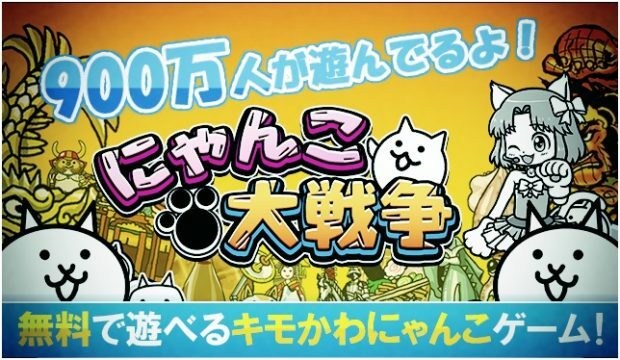 Kyoto-based mobile game publisher Ponos has announced that its popular tower defense title Battle Cats has surpassed 9 million downloads as of May 3rd. At the same time, the company is announcing that its repertoire of smartphone apps have now seen over 33 million downloads in total. That total surprises me, because while the company has a lot of games, Battle Cats is the only one that has ever really gotten my attention. While it has been a while since we’ve looked in on this title (the English version was retired last year, much to our despair), the most recent million downloads have come in 110 days, quicker than the previous million, which required 137 days. Ponos has recently started airing a series of commercials here in Japan for Battle Cats starring singer Sachiko Kobayashi. They’re pretty strange little promos, which is perhaps fitting, given how strange the game actually is. They ran from April 28th until May 4th, and likely were a big help in giving the game a push in the past few weeks. I’m still a big fan of this game, and if you don’t mind venturing into a Japanese-language title, I encourage you to check it out.